KERO farm has been set up to support the orphans in Beracah Orphan Care and to provide employment for people in the local area. 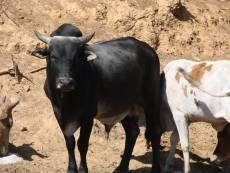 The key person in this partnership has pulled together a team of people to establish a commercial farming operation in the Kawambwa District of the Luapula Province of Zambia. They are passionate about alleviating the poverty of their people, especially the orphans in their churches. Their primary focus is to generate funds to support the orphans and to give opportunities to other poor people. Bright Hope World is assisting them to set up the farm and to get it to the point of generating a profit. A new strategy was developed that is currently being implemented. This strategy will see cash crops such as maize, beans, ground nuts and Irish potatoes grown to create some cash flow. As well as this, long term crops are being planted - bananas, pineapples, citrus and oil palms. Research is being done into eucalyptus and pine plantings as well. The farm has already supplied pigs and goats to some of the guardian families of the orphans in Beracah Orphan Care. The current beneficiaries are those working on the farm as employees. The primary beneficiaries will be the orphans and vulnerable people who receive help in the future. Currently these beneficiaries are registered by another organisation called Beracah Orphan Care that is being funded by Bright Hope World. We really like the concept of a farm that is self sustaining, creates employment and development in the area and that supports the local vulnerable people. We also have a lot of confidence in the key person and the team he has pulled together. The key person is Gershom Kasongo. Gershom has given his life to this area of the country. 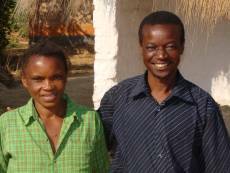 He shifted to the Mushota area in the 1980s and became a church planter. There were few churches in the area. He has been responsible for planting over 20 churches that form the backbone of Beracah Orphan Care and KERO farms. He and his wife Jenipher have eight children, two of whom have been lost to local sicknesses. It is not an easy life to live. Gershom has three other people with him on the board of KERO farm. 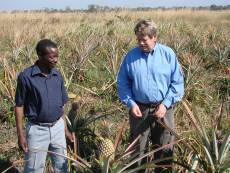 The farm is a registered charity in Zambia and supplies accounts each year to Bright Hope World. The 2011 budget will require around $US8,000 but the plan is that by the end of 2011 the farm will be self-sufficient and contributing to the care for the orphans.